For a business, customer and employee comfort is crucial. If customers aren’t comfortable, they won’t stay. If employee’s are freezing due to a broken heater, or frozen solid during winter due to a heater that isn’t working correctly, you are losing money. 5 Star HVAC contractors understand the needs of our commercial clients. We not only understand that you need your HVAC system repaired and back in working order quickly, we realize that it needs to be done in a manner that has the least amount of impact on your day to day operations. Upon your call, licensed and trained technicians from our team will come to the rescue. These technicians have ample experience in fixing broken Commercial HVAC units. When we get to the root of the problem, we will provide a flat-rate price needed to start the needed repairs. We don’t do surprise fees or hourly costs because we want you to be informed of exactly how much the necessary repairs cost. Call us at once when your air conditioning needs professional assistance and we will respond immediately. With a service call fee of only $59* and a guaranteed high quality of work, you are making the right choice by dialing our number. Each and every truck we have are filled with pieces and parts necessary for most repairs, making our service faster. 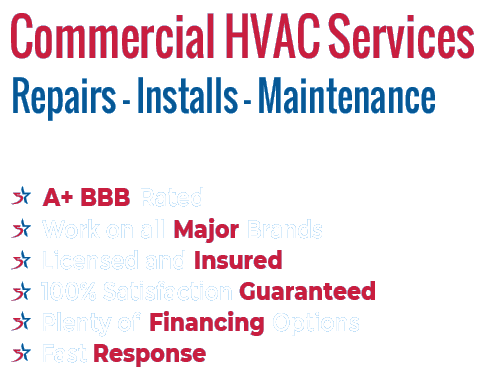 What is the greatest thing about our commercial HVAC service? We provide a 100% written guarantee and an insurance coverage should there be any issues with the unit we fixed. Why? Because we want only give the best one-of-a-kind service to all our clients. All our repairs have a warranty of two (2) years, inclusive of the parts. Some parts even have a lifetime warranty. Also, together with our efficient, high-quality repairs, we also offer maintenance service, which means that we will continually check on your HVAC unit to be sure that it is still working properly and prevent further problems. Whether you need maintenance services or urgent repairs, our technicians will come to you right away to give you the best result. For us, it is essential to get the work finished the first time we try. This is what makes us stand out from other air conditioning repair and system companies. Plus, you can contact us any time. It doesn’t matter if it’s during the day or night. We offer non-stop service and we will always be available. We assure you that we are not just reliable; we provide great service as well. Give us a call; set up an appointment and see for yourself. If you don’t need us right away because you have something scheduled beforehand, let’s arrange a schedule to your convenience. In this way, you can do whatever you want to do and stop stressing about your broken unit. Leave the worrying and the fixing to us. Our efficient and professional commercial Air Conditioning Repair and Service can rid you of all those cumbersome and irritating HVAC repair procedures. If you choose our services, the job will be done so quickly that you won’t even remember the feeling of having a broken air conditioning unit. So, if your air conditioning system ever breaks, call us and we will be there. With a vast service area coverage (Rowlett, Rockwell, Frisco, Garland, Richardson, Mckinney, Plano, and Frisco to name a few), reasonable prices and professional service, we are the in the market. Expert commercial HVAC maintenance delivered semi-annually or quarterly at a fraction of the price the other guys charge. 5 Star HVAC Contractors are your commercial HVAC specialists. Whether it’s a simple repair or a full blown installation or replacement, we can handle it. Call Today.